Connectivity tells the story of how the commonality of shared patterns connects people together. The patterns represent various facets of the human experience and are rendered as symbolic interpretations. All the patterns are surrounded and injected with the strong lines on the canvas which bridge and connect them together, illustrating how these elements form a shared, communal bond. Starting with the top canvas and working down, the canvases represent: spirituality, water, infrastructure, people as the cog in the wheel, (to the left) biological organisms, technology, natural resources and (to the bottom right) culture as resembled by an evil eye. 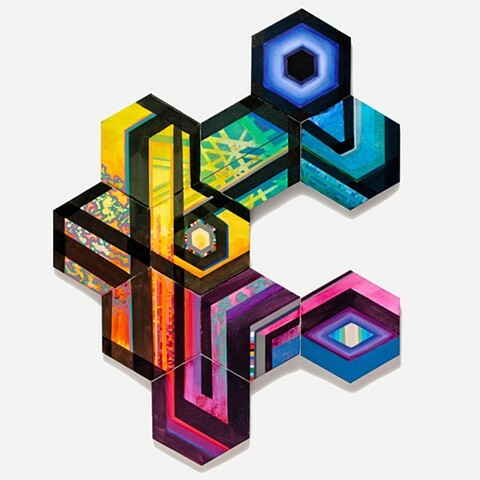 The middle canvas (the cog in the wheel) symbolizes the diversity of people by using a multitude of colors that make up lines that are connected and move together. The composition resembles a machine made up of many components and centered by people working together who keep it in motion.